My next favorite---by the artist Charlie Harper published by Puckerbrush. Stitched over one --the snowflakes were ENDLESS! But I still love it. Love love love it! I have his Sanderlings to be stitched--hopefully before the year is out!! 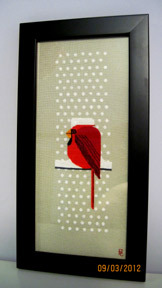 As soon as I saw yours I knew it was a Charley Harper!! Nicely done! Hugs! Hi Maggee and Peg, I LOVE Charley Harper! I made one of his works into a project on my own. I'd be willing to trade with both or either of you mine for yours?